From exciting new artists to major gallery renovations, 2017 has held several major milestones for Park West Gallery! With 2018 around the corner, we’re taking a look back at some of our favorite moments from the past year. We look forward to experiencing more moments like these with our collectors in 2018. Happy New Year! Park West Gallery and the Detroit Institute of Arts have been longstanding fixtures in Michigan’s art community, but 2017 marked the first time the two joined forces. Park West Gallery and the Park West Foundation sponsored the DIA’s exhibition, “Monet: Framing Life,” highlighting the origins of Impressionism with 11 artworks by Claude Monet and Pierre-Auguste Renoir. The exhibition is on display until March 4, 2018. 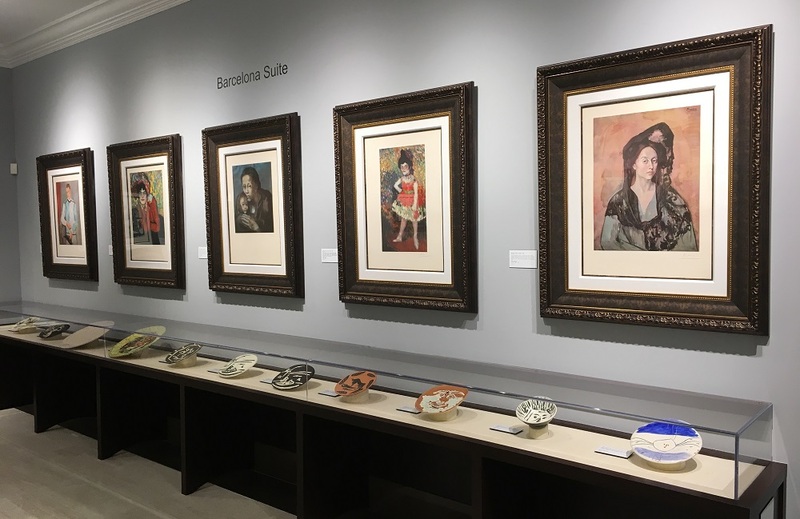 Park West Gallery’s headquarters underwent major renovations this year, greatly expanding the scope of Park West Museum, the gallery’s free-to-the-public museum showcasing artwork from some of art history’s greatest figures. 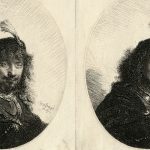 The bigger-than-ever museum now features artwork by Pablo Picasso, Rembrandt van Rijn, Marc Chagall, Pierre-Auguste Renoir, and other masters. Park West Museum also houses artwork from museum exhibitions around the country featuring contemporary greats like Yaacov Agam and Peter Max. Park West Museum is located within Park West Gallery’s headquarters in Southfield, Michigan. Renowned kinetic artist Yaacov Agam joined the elite group of artists who have an entire museum dedicated to their art. 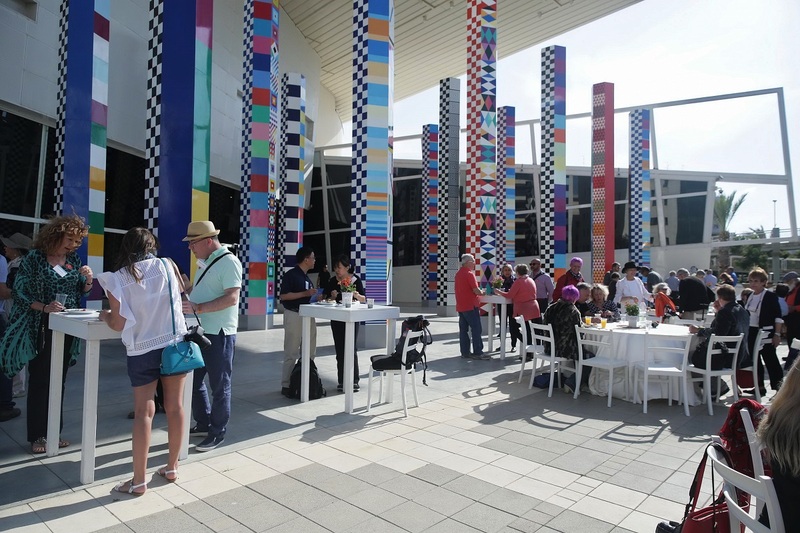 The Yaacov Agam Museum of Art, located in Rishon LeZion, Israel, opened on October 26. 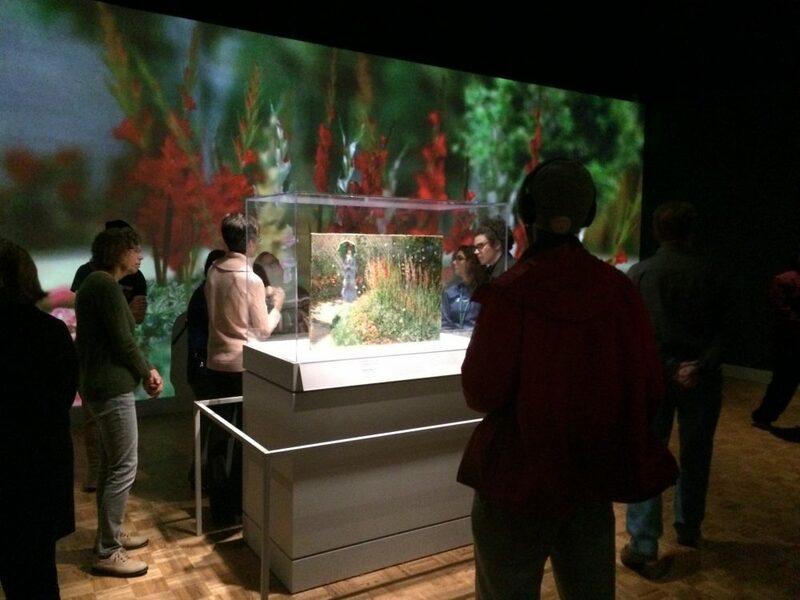 The museum is publicly funded and supplemented by donations from the Park West Foundation and other contributors. Park West Gallery celebrated the opening with a special reception for its VIP clients and a tour of the museum by Agam himself. Park West Auctioneer Jason Bartlett displayed an amazing feat of heroism in October when he saved the life of a drowning woman. While in Hawaii during a Carnival cruise, Bartlett saw a woman struggling in the water and didn’t hesitate to act. He dove in to save her from the rough waves. The crew of the cruise ship recognized Bartlett for his heroic actions with Carnival’s “I am Hero” award. “When I saw the lady I made it personal, because that lady could be a mother, wife and daughter to someone, so I treated the situation like I would treat my family,” Bartlett said. Gregory Arth – Arth takes ordinary circuit boards and other pieces of technology and transforms them into dynamic, textured artwork. Matt Beyrer – Inspired by nature, Beyrer incorporates the natural grain of wood panels into landscapes and still life compositions. Orlando Quevedo – As the leading proponent of “Magical Realism,” Quevedo blends architectural interiors with elements of illusion and antiquity in his surreal art. 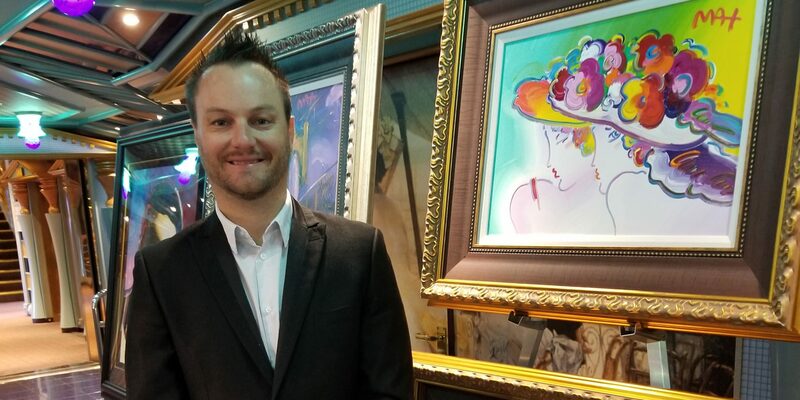 Alexandre Renoir – The great-grandson of artist Pierre-Auguste Renoir, Alexandre creates colorful landscapes and floral studies in an Impressionist style. Park West collectors can’t get enough of these new artists. In fact, Beyrer had a run of eight sold-out consecutive VIP auctions, becoming the first artist to achieve this in Park West VIP history. 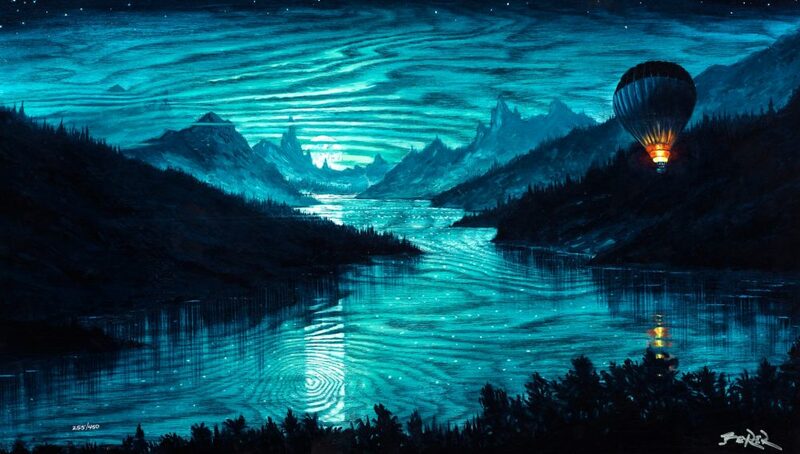 Park West Gallery artists constantly explore the latest methods in creating art. In 2017, a combination of ancient techniques and modern technology emerged—caldographs. Artist Csaba Markus is the innovator of the medium, which uses dye sublimation to bond images onto wood at a molecular level. 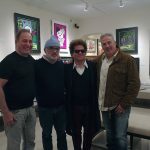 Other artists who have embraced the medium include David “Lebo” Le Batard, Tim Yanke, and Matt Beyrer. The Solanus Casey Center selected artist Dominic Pangborn to create artwork in celebration of the beatification of Blessed Solanus Casey. Following the beatification, Casey is one step closer to being declared a saint by the Catholic Church—that would make Casey the first-ever male Catholic saint from the United States. Pangborn created one of his trademark Art in Motion artworks featuring Casey to welcome the thousands of annual visitors to Detroit’s Solanus Casey Center. 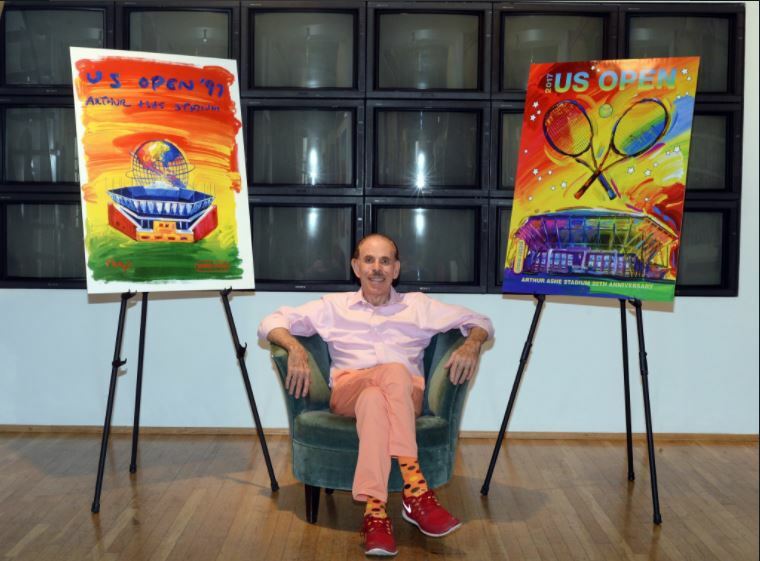 Pop artist Peter Max celebrated the U.S. Open in 1997 by painting the event’s official artwork featuring the Arthur Ashe Stadium. In 2017, the U.S. Open knew exactly who to turn to for the stadium’s 20th anniversary. “We could not think of a better way to kick off the 20th anniversary of Arthur Ashe Stadium than by ‘returning to the source’ and having Peter Max create another signature work that truly captures the power of tennis’ grandest stadium,” Katrina Adams, USTA president and chairman of the board, said in a press release. Robert proposing to his girlfriend, Rachel, during an art auction at sea. Park West art auctions are full of beautiful and surprising moments, which is why Park West collector Robert saw it as the perfect romantic setting to propose to his girlfriend, Rachel. 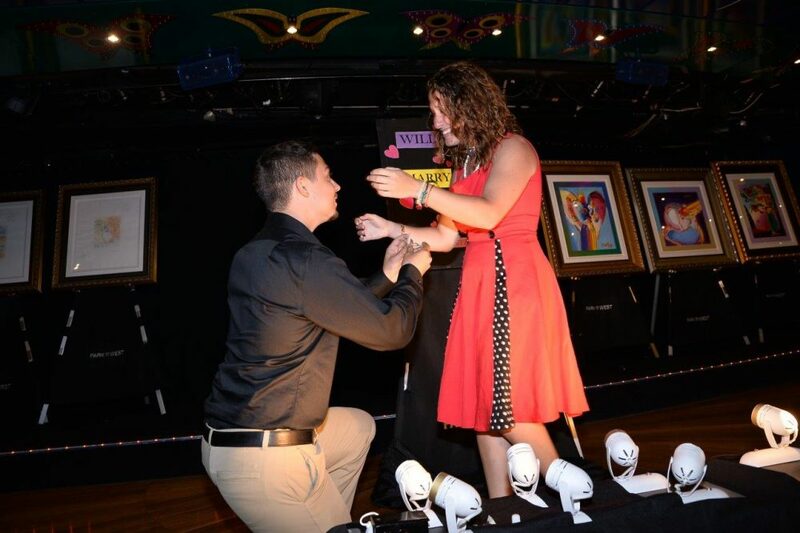 During a cruise aboard the Carnival Pride, Robert worked with Auctioneer Jessica van Rooyen to plot an elaborate wedding proposal. When a veiled work of art appeared on stage, Robert bid on it and won. Art prodigy Autumn de Forest has exhibited her art all over the world, won awards, and has even presented her art to Pope Francis, to name a few of her many accomplishments. It’s no wonder, then, that Teen Vogue selected the 16-year-old artist as one of its “21 Under 21,” a group of young women changing the world for the better through their actions. This past year kept de Forest busy. She also appeared on Australia’s “Sunrise” television show and held solo exhibitions at the Monthaven Arts and Cultural Center in Tennessee and the LeRoy Neiman Art Center in Harlem. Ongoing pure pleasure to read your newsletter. Thank you and continue the good work. From Québec, Canada, I wish all the best for 2018 to art lovers across the world. Thank you, and a wonderful new year to you too! What a GREAT Top Ten. But how about #11…a close runner-up….SeBelle Bowman gets “hitched”! Thank you for the wonderful recap of last year. I am a 100% disabled/ retired US Army Ranger&US Marine Scout Sniper. Due to my wounds I have periods where my chronic pain is elevated and I’m not able to travel ( no regrets or complaints). I say this because I had been invited to Nemacolin, PA., for the weekend with Peter Max and many other great Artists. To miss Peter Max when my wife and I live about an hour a way was heart breaking! Thank you for the picture in the Summary and all of the other pictures and descriptions. I grew up in the 60’s and Peter was my artistic motivation and idol and I grew artistically as he moved from the cartoon style to the current, beautiful, free style, he expresses now! Thank you guys for ALL you do! Through your auctions, letters, etc… I’ve been able to educate my children about art on canvas or any medium for that matter. Now they have identified with their favorites and are on the hunt, and creating/expressing themselves through art as well. Thank you Neil, you are an inspiration to us all! Our top PWG moments of 2017 were meeting and acquiring art of Alexander Renoir and Tim Yanke. Thanks guys! Always a pleasure read about Park West! My wife and I treasure our relationship with Park West – from the fabulous artwork we’ve collected to the stories and updates we receive on-line and in “Collector” magazine. Thank you for enriching our lives. I bought three David Najar art pieces while on a cruise. Can you please show some more pieces and speak of his current successes? Hi Joan! We provided you request to our Client Services department. You are welcome to follow up with us at (800) 521-9654 ext. 1 or clientservices@parkwestgallery.com. This was a great way to catch up, very inspiring! Csaba Markus is my absolute favorite (I’m a holder of 4 pieces of art of his — “Waiting” being my fav) and this video just grabs my heart! I would love to meet this man sometime in my future! love this! Happy New Year to all at Park West from a happy Csaba Markus collector (9 lovely ladies)! Please wish the great Csaba a happy, healthy, prosperous and creative New Year from a huge fan of his work! Looking forward to another Park West auction on board the Diamond Princess 11/1/2018.Highly recomended.Thank you Park West. Love to visit Park West gallery and museum one day. Its on the bucket list. Hello David! We recommend contacting our appraisals department at appraisals@parkwestgallery.com with the artwork information. So looking forward to our next cruise in April 2018 & always enjoy attending & sometimes purchasing at your fun & educational auctions. Czaba Markus’ original art work will forever be featured in our home. Looking forward to viewing his latest works. Good luck Czaba. Great Newsletter. The thing I appreciate about ParkWest is the commitment to teach laypeople about art. Not everyone (including me) is a big-time collector. But ParkWest has an interesting way for me to enjoy art. Michael Godard as “The Hairdresser” was my PWG 2017 memorable moment. Park West collector for many years. How would I go about upgrading my art from mixed media to originals ( Peter Max ) No doubt the art work that I purchased from Park West years ago has increased in value. 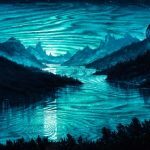 will that be taken into account toward the purchase of original art work ? Hello Paul! We’ve passed your inquiry along to our gallery consultants, but feel free to contact them at (800)521-9654 ext. 4 or sales@parkwestgallery.com about upgrading your art. So many favorites!!!! We could not live (love) without our ParkWest experiences!